What Are Tests for Castleman Disease? How Do I Get a Diagnosis? Castleman disease (CD) is rare, and its symptoms are very similar to those of other conditions. So it can be hard to get the right diagnosis. There is no single test that will show that you have Castleman disease. But your doctor can use a combination of tools to look for signs and rule out other diseases. You might first see your doctor about the different symptoms you feel, such as fatigue, fever, or night sweats. Your doctor will give you a physical exam and ask about your symptoms and any other health conditions you have. If they think you might have Castleman disease, they might order blood tests, imaging scans of your body, or do a procedure called a biopsy to test your lymph nodes. This is the surest way to diagnose Castleman disease. In this procedure, doctors remove part or all of the affected lymph node to look at it under a microscope. A biopsy can be very simple or more involved, depending on where the lymph node is. If it’s near the surface of your skin, a surgeon can numb the area around it, make a small cut, and remove the tissue. If the enlarged lymph node is in your belly or chest, you may need to be put under with general anesthesia so the surgeon can make a larger cut. Sometimes doctors can use special techniques that require smaller cuts for these biopsies. Ask your doctor if that’s a possibility. One or more of these tissue types in your lymph nodes doesn’t always mean you have Castleman disease. They can also be found in more than a dozen other diseases, including non-Hodgkin's lymphoma, rheumatoid arthritis, and Epstein-Barr virus. Your doctor will look at your biopsy results along with other tests to diagnose you with Castleman disease. Because Castleman disease is so rare, a hematopathologist, a specialist in blood and lymph node diseases, also may need to look at the biopsy. These tests can help your doctor rule out other diseases and, if you do have Castleman disease, they can help your doctor know which kind of you have. Scans of your body can show your doctor if enlarged lymph nodes or organs are causing your symptoms. A chest X-ray allows your doctor to see inside your chest. An enlarged lymph node there can make it hard for you to breathe by pressing against the windpipe or airways leading into the lungs. An ultrasound uses sound waves to get a picture of internal organs. It can show lymph nodes near the surface of your skin or in organs such as the liver or spleen. A CT scan is a powerful X-ray that can combine pictures to create a 3-D image of lymph nodes and organs inside your body. An MRI can help doctors spot enlarged lymph nodes near your brain or spine. An MRI uses a powerful magnet to create a 3-D image. 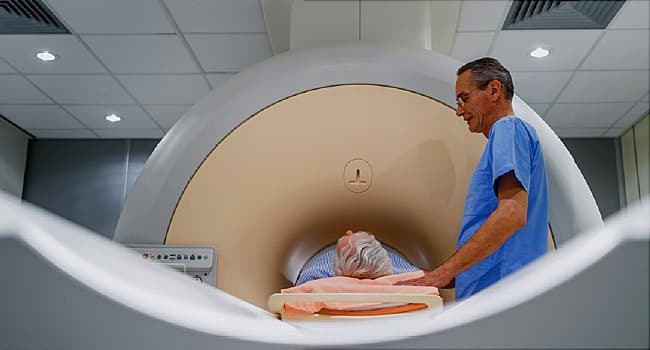 A PET scan may be useful because it shows fast-growing cells in your body. You’ll get a radioactive sugar injected into your blood, and a special camera shows where the sugar is absorbed in the body. Fast-growing cells like those in Castleman disease take up more of the radioactive sugar than normal cells. Your doctor will need to weigh all the test results and symptoms before concluding you have Castleman disease.